Gaining lessons from Capella Incident, Security Council decided to introduce several new classes to terran fleets and vasudan battlegroups. Akheton Corporation designed the Nekhbet as offensive tool of choice of Vasudan Empire. A younger terran equivalent Eurynome was introduced a few months later as warship focused more on precision strikes rather than on raw firepower. While Nekhbet was designed purely to inflict tremendous damage from it's three spinal beam cannons, vasudan heavy corvette offers zero utility beyond raw firepower. Terran approach to the problem of strike corvette featured an idea of multi-task, mobile unit with extended anti-bomber weaponry. First draft of the Eurynome quickly become one of the most successful designs ever produced by terran manufacters. 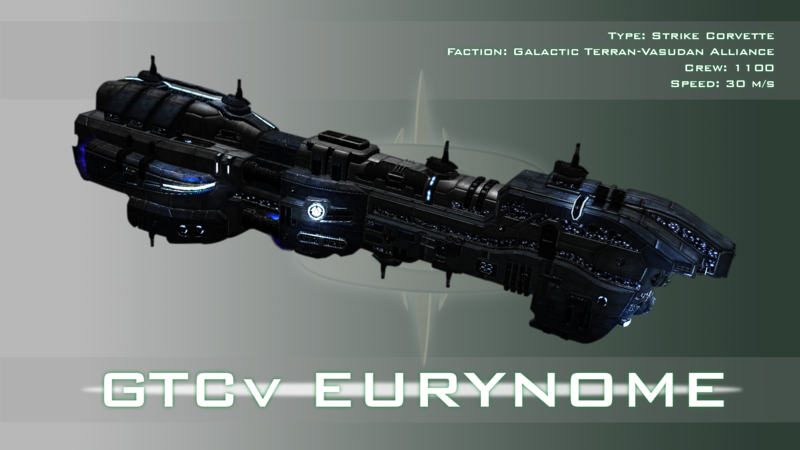 First warship based directly on famous Deimos corvette, the Eurynome was designed to succeed where Deimos failed. Alrough both corvettes sharing strong anti-fighter screen, Deimos was somewhat lacking siege potential. Frontal section of the Eurynome was designed around two heavy slash beam cannons. While Nekhbet was designed to inflict puncture damage, ultimeate goal of the Eurynome was designing a medium-sized warship with outstanding area on effect splash damage to strip down it's target from turrets and crucial subsystems. Lack of puncture beam cannons was justified by three Venom LRST missile launchers, able to inflict minor damage and take down main weaponry of the target before Eurynome is in range of her two main and two secondary beam cannons. Alrough Eurynome was mostly inspired by shivan Ravana destroyer, designers featured small hangarbay inspirated by Moloch corvettes. Another notable feature is the most up-to-date jump drive with precision jump capacity. Eurynome has also one advantage compared to Nekhbet. Vasudan heavy corvette despite being formidable enfroncer, requires fighter assistance or protection of anti-fighter cruisers. Eurynome with her excellent point defences is able to operate alone, or protect the flanks of bigger vessel like Boreas class destroyer. Almost three dozens of Eurynome classes were produced so far. Five newest vessels of this class - GTCv Brenner, GTCv Blitzkrieg, GTCv Lateralus, GTCv Endymion and GTCv Isonomia were recently introduced into 6th Fleet of Herschel. Yeeee... I promised myself - No exclusives in SG: Reborn! Not even a single one! Okay... Maybe except HTL Nightmare ships... But this is not one of them! Deffinitly not. I made Eurynome for a lot of reasons: First, I wanted replacement for c914's low-poly TCv Tane. I wanted to make some competition for Aesaar's Chimera and Belly, as they are probably the only released high-poly corvette-sized terran ships. And finally I wanted to texture something and improve my skills at digital painting. And I see no reason to keep result of this efforts for myself, as she is quite beauty . Keep in mind one thing - change Fusion Mortars in turrets 05, 06 and 07. I mean CHANGE! I prepared them for UEF-style swarm torpedoes. Change beams as well, as current setup uses default green beams. Both 2048 and 4096 maps are included [as always]. Special thanks to Col.Hornet for turret models straight from the newest version of his Hera. The recent model is going well, so I decided to make a proper thread for it . The Eurynome - replacement for c914's model used in Shadow Genesis. After Neptune started his thread with questions I decided to experiment and switch between modelling styles a bit. 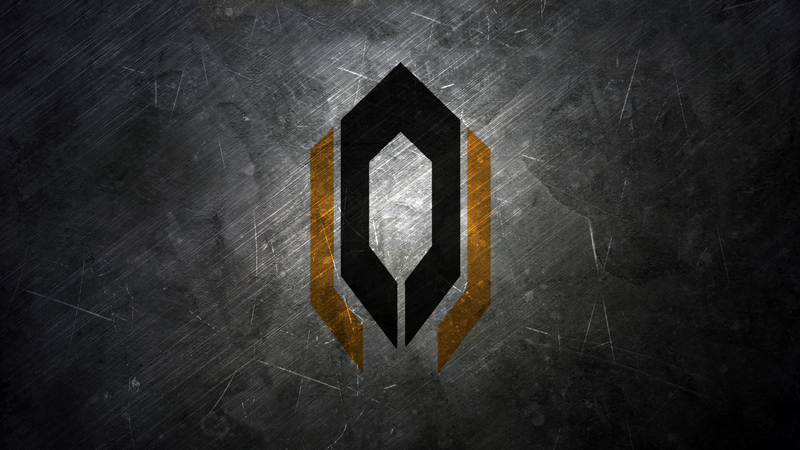 This one is focused on small details, taking some inspiration from Hades' GTCv Deimos. It's gonna be dedicated pusher, shock jumper and strike element, with two main beams, two secondary beams, three swarm torpedo launchers. Also this time I'm gonna make my own, digital-painted hullplating. I see the wavey-line in the side and i'm like "How did you even do that"
Cleaned, optimized, ready for mapping and texturing. Only 37k tris thanks to good optimalization ^^. That looks really good. Those fancy beams. The model itself is decent but that blue speckled texture looks like complete **** on everything it's applied to. Please find a better alternative. On the contrary, I think it looks great. It gives me an experimental kind of vibe. If he's talking about windows, he's right. I already baked them, but default look of the windows has it's tiling quite noticable. Col.Hornet pointed this as well, so I'm gonna do some experiments to randomize this sections a bit. I think the tiling factor is a bit too high, is all. Best solution IMO would be to take a paintbrush and make some metal structures on the baked texture around the windows themselves, to randomize the shapes and visually reduce the amount of glowing glass ("...windows are structural weakness....xD"). It will look less tile'ish and more natural. Less repetitive tiling, more structure to the lights so they look like they're clearly arranged into floors. I've noticed that the Maller in Eve does this quite well, if you want a reference. I mean I probably just stated the obivous. Progress on the texture. I reduced total amount of windows, and added some modelled elements. Rendered with glowmap instead of diffuse on details material to show new lightning.